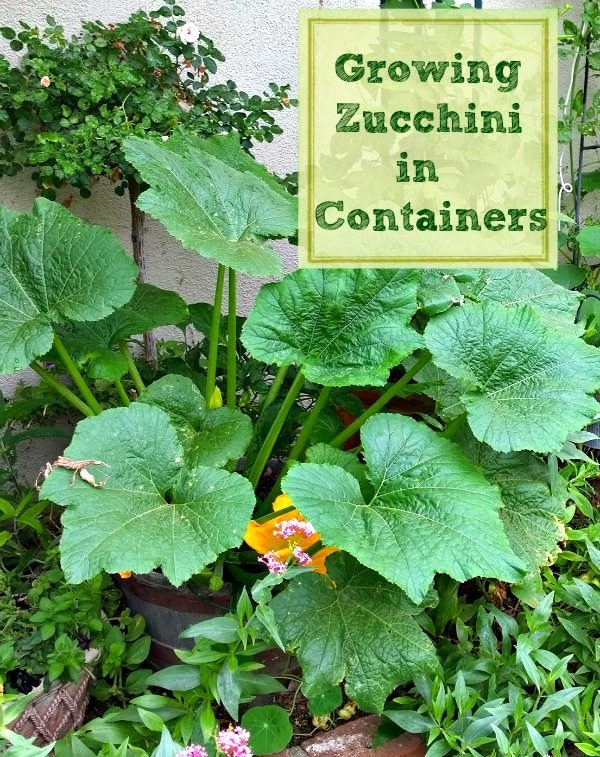 I am going to share my success with how to grow zucchini in containers. When you garden on a small urban lot you have to get creative in order to grow as many edible plants as you can. Many of our planters are root bound from all the foundation plants and trees so I have to garden above ground. Growing zucchini in southern California can provide you with fresh squash 6-8 months of the year with our long growing season. This year I took another planter and ripped out plants that did not feed us and put a few large pots in for veggies. When you grow zucchini in containers, you need a large container. I am using half barrels. I love these cause they are more wide than tall and do not dry out as fast as clay pots. Anything large will do for how to grow zucchini in a pot. You need a spot with at least six hours of sun. Mine get all midday to evening sun but are in the shade all morning. 1. Fill your container with potting soil and mix in a time release fertilizer if you are not going to feed your plant. I make compost tea but will mix in a little fertilizer when planting. Grow Bags are something I love. They are lightweight, cheap and moveable. 2. Plant either a start from the nursery or plant a small mound of three seeds. I then thin to one seedling. Now water daily if you do not get summer rain like us. Feed regularly. 3. As the flowers start appearing I will self pollinate to ensure I get a lot of zukes. I take the male flower and pollinate the female flowers growing on the tiny new baby zucchini. 4. Now just pick and enjoy your zucchini making sure to water daily if temps are high. I prefer to pick mine when they are small rather than too large but sometimes one gets away from you and it is time for zucchini bread. Here are my tips on how right way to harvest squash. Elaine, those look better than what I see in Sprouts! Good for you. You're becoming quite the expert on these things. If I had a man to bring me in some of those half barrels, I'd be doing that too! You sound like a garden writer, which is what you seem to be becoming in many ways. Check into freelancing for magazines. I think you've got the stuff! And I am a fairly good judge on these things having come from the journalism field. Am I too late to plant zucchinis now? I have the perfect containers that the dog won't be able to get to and would love to give them a try. Good advice since I can only plant in containers here too. How do tell the male from the female though? I'm not sure I know how to pollinate or is that tomorrow's post? LOL! oh my gosh, this is bringing me back. my first year that i grew zucchini in a pot, i got a huge one like yours. this is gonna sound crazy, but i held it in my arms like a baby. it was huuuge. i didn't have success the other 2 years i tried. yours look awesome! enjoy! Great idea! Space isn't an issue here, but I've learned to plant about 2 zucchini seeds. Love them, but wow are they prolific! And I do love container planting because it's so convenient! I like to grow veggies in containers too, and I think my zucchinis would do better in a larger container. Great tip about pollinating. I had some growing in a hanging pot...but replanted them elsewhere. Just wasn't big enough. I also have some in a large pot out front and it is getting quite large! I'm curious to see if we get any zucchini off them! I'm going to give your self pollinating a go ! Ooooh, those look good. Yup, zucchini bread is a favorite for breakfast. I'd love for you to share this on The Maple Hill Hop! Good job! Thanks for sharing them. We are growing them in pots! Great advice, I had tried for years to grow them in containers on the coast...now up here with much more heat, we are inundated with them...be careful what you wish for right? Very Fun! I grew mine in a left over kiddy Swimming pool that I was using for ducks a while back. Three plants that are growing like gang busters. I have been wanting to try this on my small concrete patio. Do they sprawl everywhere or are they pretty manageable in size? Because in dirt they just go nuts and take over everything. The last few years I’ve planted different veggies in containers with success. Never zucchini. Is it too late to plant zucchini in a large container, it is June 10? Live in New Jersey. How do you pollinate a male and a female?